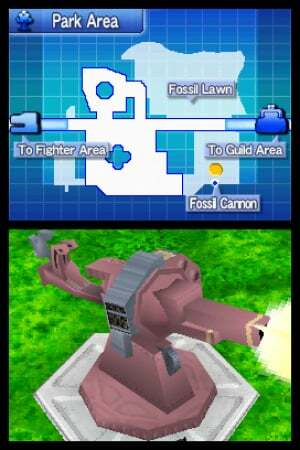 Is Fossil Fighters a worthy new IP or really just a prehistoric Pokemon? Nintendo is constantly looking to expand their horizons when it comes to new IPs, and you'd have to think that was their intention when they brought Red Entertainment's newest title Fossil Fighters on board as a first-party release. 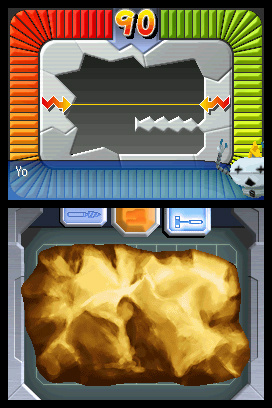 The game takes fossil hunting and builds an interesting Pokemon-style battle experience around it all. While the game does introduce quite a few new ideas into the mix, the overall experience ends up feeling like something that's been done before. When you first begin, you're given various choices of dinosaur traits to choose from that will ultimately determine the types of dinosaurs you'll be playing the game with. You'll then go through a fairly in-depth tutorial of the game's many elements before you're tossed into the adventure itself. 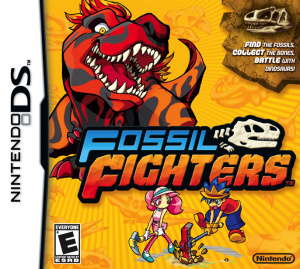 Your ultimate goal is to become a Master Fighter, but to do this you'll have to learn the game's many elements, which range from locating and digging up fossils to reviving and battling these dinosaurs in Fossil Stadium. To begin with, you must venture to various dig sites around the island to locate hidden fossils. You have a sonar that you can use to locate them and as you earn money in the game you can even upgrade your sonar to locate some of the more well-hidden ones. Once you've located the fossil you must then dig it up and take it to the Fossil Center for cleaning. Cleaning a fossil can be a tricky affair and is done using the stylus. You have two tools at your disposal, a hammer and a drill. 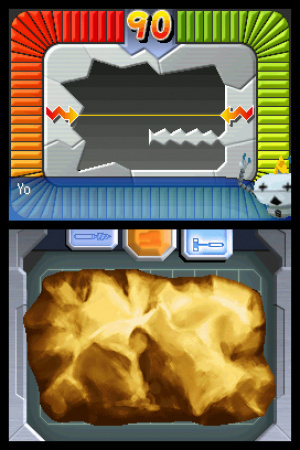 The hammer can be used to knock large chunks off of rocks to get down to where the fossil is located, and then you can use the drill for more delicate cleaning. But you have to be careful not to damage the fossil as you're graded based on how well you perform the cleaning. The higher your grading percentage, the stronger your revived dinosaur will be. The next step is to revive your dinosaur using your newly-cleaned fossil. You must have the head fossil in order to revive the dinosaur, but the more parts of the dinosaur's body you can locate and clean, the stronger that particular dinosaur will become. This is why you'll find it important to go back and locate more parts of your dinosaur if you find yourself getting defeated in battle. You can even add these parts to your dinosaur after its been revived in order to give it a higher ranking and more skills to use in battle. Once you've revived your dinosaurs, it's time to take them into battle. You can take up to three into battle at a time, each in a different position on the fighting grid. You'll do the majority of your attacking with the dinosaur you place in the front position, but you'll also have to rely on the other dinosaurs in the support positions to help out as well. 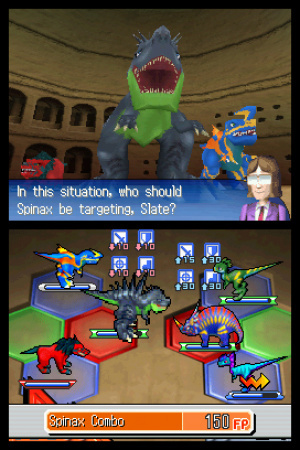 You can even rotate different dinosaurs into different positions during battle if need be. The battles are turn-based and fairly simple in design and execution, but you'll soon find that there's more depth to the battles as you acquire new skills and fight some of the more expert fighters. As you win battles, your vivosaurs will move up in rank, making them even more powerful. As you win more battles, you'll soon be able to fight Level-Up Battles that allow you yourself to move up in rank. This in turn will open up new sections of the island for you to dig in. This is where you'll begin to find some of the more powerful vivosaur fossils with some of the more powerful skills and abilities in your quest to become a Master Fighter. Of course, to keep the game interesting, there are quite a few fetch quests along the way that follow a specific storyline. You'll meet new characters and have to help them out at times, which will open up new battles for you to take part in. The pacing of the game can be a bit sluggish at times, indicating that the developers were trying to gear the game at a younger audience, but it at least gives you plenty of time to come to grips with the game's many gameplay mechanics before tossing you out on your own. The cleaning of the fossils is a lot of fun at first, but you'll quickly find that it takes up a lot of your time in the game and can become somewhat tedious after awhile. The story twists help break up the monotony a bit, but you can't help but feel that some more variety in the actual flow of the game might have helped it feel a bit more fresh. The lack of difficulty might also be a factor for those who are looking for more challenging battles. While there's no online modes or fossil trading, there are several local multiplayer features you can enjoy. Each player will need their own copy of the game, as download play isn't supported. You can not only trade fossils with each other, but you can also take each other on in battles to see who's vivosaur teams are ultimately the strongest. It's certainly not an integral part of the actual game itself, but it does offer a nice diversion for those looking to take a break from the main game or for some multiplayer action. The visuals in the game range from very good to fairly bland. There are some areas that show a lot of detail and vibrancy, but there are also quite a few parts that could have used more work. The actual dinosaurs look fairly detailed, but the lack of animation on the battle grid makes them seem a bit lifeless. One other graphical touch that can be annoying is the way the characters walk; not only does it look completely unrealistic, but it's actually mildly comical after awhile. It just gives the feeling that more graphical polish might have made a world of difference. Musically, Fossil Fighters has some amazing moments. There are a few tracks that are absolutely outstanding, and it would be difficult to dispute that the audio experience in the game is easily its high point. Even the sound effects are very well done and show far more polish than the visuals. It might have been nice to have voiced dialog, given the vast array of characters and personalities, but it's easy to overlook given the quality of the musical score itself. You'll definitely want to crank up the volume on this one. 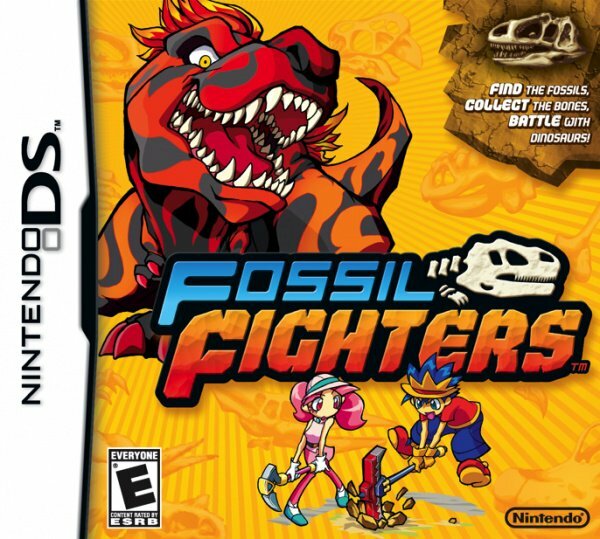 It would be quite easy to label Fossil Fighters as nothing more than a prehistoric version of Pokemon, but there are quite a few gameplay twists that will ultimately make it appeal to an even broader audience. The game's mechanics are simple enough for gamers of all ages to enjoy, but there's also enough depth and replay value to keep those looking for a slightly more varied gameplay experience coming back for more. Sure the game can be a little repetitive at times, but it's still got enough charm and personality to make it worth a play. I may check this out sometime, but I'm playing a lot of other games right now. Another Pokemon clone bites the dust. I still haven't indulged in Pokemon yet, and not a fan so this doesn't appeal to me. Great review Corbie! I know that you put a lot of time into this game so I know that I can definitely trust this review. I wasn't particularly interested in this game to begin with but now I am kind of curious. It seems interesting enough for me to want to give it a try at least. It may not be Nintendo's next big franchise but it still sounds like a pretty solid effort. And yes; I too was NEVER EVER interested in Fossil Fighters! Pokemon takes up enough of my time, without wasting it on inferior clones and Pokemon-alikes. Can't wait for the remakes of Gold and Silver! Great review, Corbie!! I was surprised you didn't go into a bit more detail with the battle system but that's okay because the review turned out great anyway. I thought this game was too similar to Pokemon, I might as well play the real deal instead. Great review, Corbie! I actually might pick this up...in a few years. Great review, well done. @ KnucklesSonic8 - Yeah it was a bit tough to narrow down all the things I wanted to talk about in the review since there were so many in my notes. 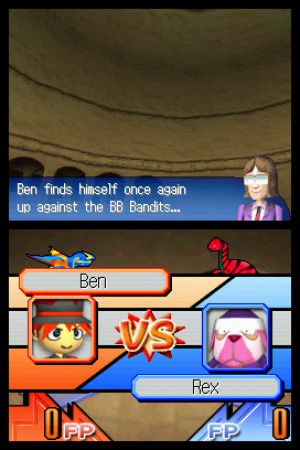 I was afraid if I went into too much detail about the battle system, it might take away from the game for some people. Thanks Corbie, this was a very informative review , I love dinosaurs, and this game sounds like my cup of tea, but, I'll wait till the price drops, and I would even if I had the money. This never looked good to me. Spring 2010. That's when I'll fight monsters with monsters. I played the cleaning demo from the Nintendo Channel and decided to pass. Having to do that for every fossil? No thanks, it wasn't that much fun. I have no interest in Pokemon but will probably get this. I just cannot get into the pokemon franchise (I have 2 kids that are hoked on it) but fouind DQM - jokers on DS pretty cool and I reckon I'll like this too. Youd think with all the comparisons to pokemon someone would point out that "reviving fossils" was first used in spectrobes. But hey, i guess noone thought of it. oh lol i saw jim jams comment a second after i posted mine. Got the game and it's pretty good, but a bit short.